One of the most promising WiiWare games due later this year has to be Icarian: Kindred Spirits which is being developed by the newly formed independent studio ‘Over The Top Games’ based in Madrid, Spain. The screenshots we have seen of the game so far look really nice, even LostWinds quality. If the gameplay is also as good we will have a winner on our hands here. WiiWare World: Can you tell us a bit about Over The Top Games studio? Roberto Alvarez de Lara: Our studio was born with the intention to produce games that we would like to play ourselves. It’s great to be able to create games with total creative freedom. Currently based in Madrid, Spain, we are a small team of four people, all with several years of experience in different areas of game dev. WW: What is the storyline in Icarian: Kindred Spirits about? RL: In Icarian we’re telling the story of Nyx and Icarus. Icarus, with his wings made of wax and feathers, flew so high that he reached a realm in the skies. There, he met a very special being…her name was Nyx. Nyx, a young mysterious girl, automatically became fascinated by Icarus: he was the only human being she has ever met… and he had wings, just as her! From there a beautiful friendship starts. One day the earth mysteriously collapsed and Icarus disappears, leaving her alone. Nyx, worried about her friend, departs from her realm and goes in search of Icarus. From there Nyx will have to fight in a hostile world, guided by Gods that will help in her quest to find what happened to Icarus. 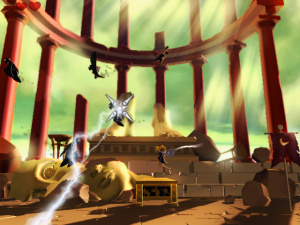 WW: Would you say the similarities to Nintendo’s Kid Icarus are only superficial? 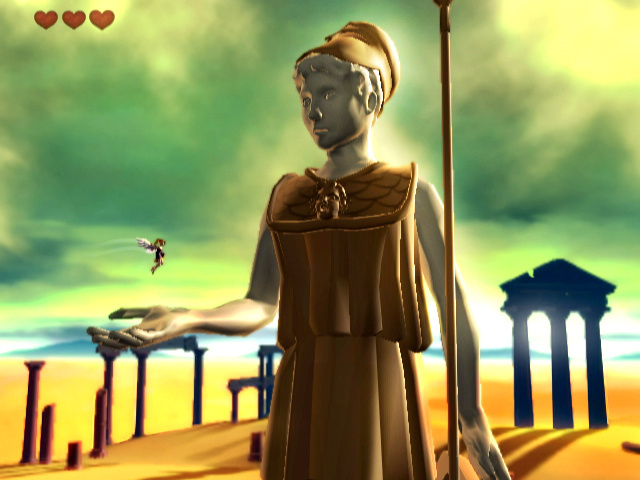 RL: Both Icarian and Kid Icarus are games inspired by the same source: the story of Icarus. When it comes to gameplay, our game takes full advantage of the Wii to present the player with very fun and challenging situations. Surely, fans of Kid Icarus will greatly enjoy our game. WW: How do the controls work in Icarian? 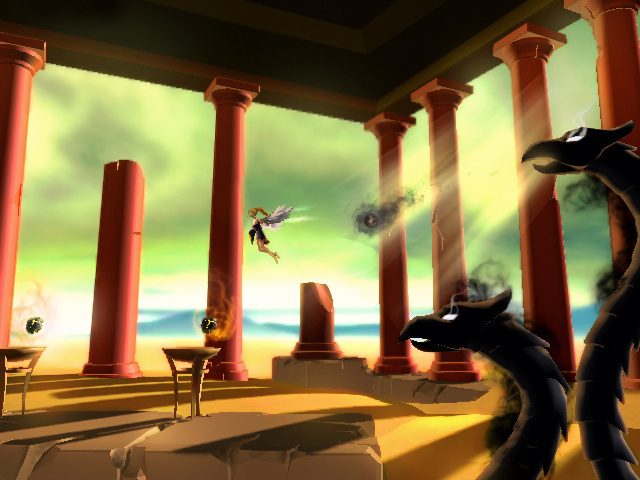 Is the flying action anything like that in LostWinds? RL: With Nyx you can move and jump (in our case fly) as other platforms game. For this you use the Nunchuk + Wii Remote controls. The great thing about our game is that you can fly and stay in air a lot more time. You will be able to travel long distances just by flying. But be careful, you have limited flight endurance. Additionally, with brief movements of the Wii Remote the player is able to cast special movements to attack and defend from enemies. These are done using the Wii Remote. Some Gods decide to help Nyx in her quest. So at the start of the game Nyx is very fragile. As the adventure proceeds the player receives powers to use while aiming at the screen. These powers let Nyx move obstacles, build stairs with rocks, impulse herself, shoot, etc. WW: Can you tell us more about the power of the Gods you can summon and how this affects the gameplay? RL: Most of the gameplay is designed around the God powers. 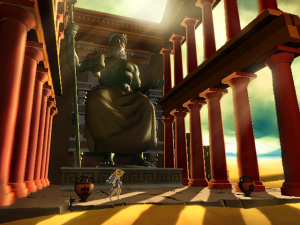 When you start the adventure you receive one power by Zeus that let you move some objects in the scenery. With the help of this power you will be able to move rocks, columns and other obstacles. You can do a lot with this power. Let me show you an example. You are facing a Hydra. This foe is a fierce big enemy that shoots fireballs at Nyx and is too powerful to be defeated by her. Well, if you have the powers of Zeus, you can use these fireballs to your advantage. Grab some of these with the Wii Remote and impact them to harm and beat the Hydra. This is a brief example of the kind of gameplay you will find in the game. 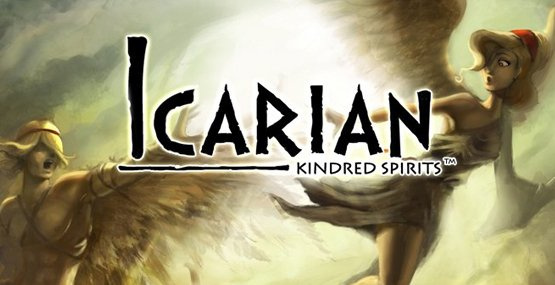 WW: How will the 2 player cooperative gameplay work in Icarian? RL: One of the players will control the movements of Nyx. He will be able to run, jump and fly. The other player can play just with the Wii Remote (the Nunchuk is not required for the second player). He will be the one casting the powers and helping the first player. The fun part is that sometimes you need to be strongly coordinated, so you need to talk and synchronize with your buddy. WW: The screenshots we have seen so far look no less than stunning. Can you tell us more about the artwork design and game engine you have developed? RL: It’s a 3D engine developed entirely with custom technology. It’s specially designed to take the full advantage of the Wii, and, at the same time, be easily portable to other platforms. This will make things easier for us for the next projects. Although the Wii graphics are not as powerful as other 'current-gen' consoles, we have paid special attention to develop and incorporate tools that let artists accomplish beautiful and very detailed sceneries. Most of the limitations have been corrected paying attention to shadows and lighting. Our goal was to create a very attractive game for the standards of this console. 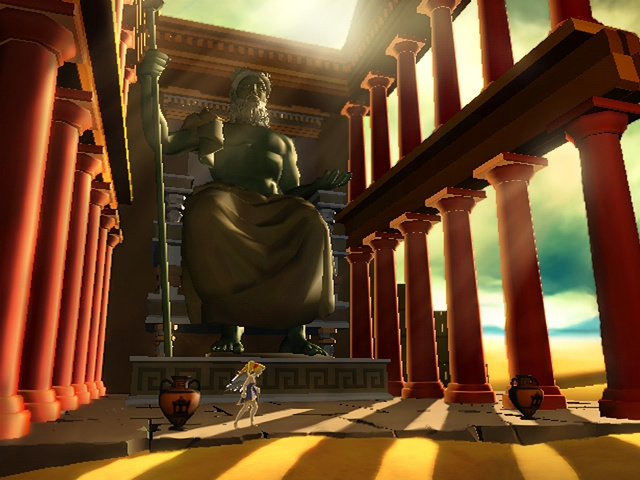 For the graphics we were highly motivated by paintings by Dalí and Giorgio de Chirico. The environment and feeling we want to transmit are inspired in several of their works. WW: How long will the game take an average gamer to complete? RL: It will greatly depend of the type of player. Our game features levels that are more similar to old school platforms games and there are some places were you have to take your time and find the solution of a puzzle. We’re working hard to create a good balance between gameplay, number of levels and game length. WW: Do you plan to launch in both Europe and North America? When do you expect the launch date to be roughly? WW: How many Wii points will this retail for do you think? RL: We still have to wait to what Nintendo has to say. They have the last word. WW: What are some of Over the Top Games favourite WiiWare games so far and why? RL: I’ve to say World of Goo. It’s a beautiful game with PERFECT gameplay and very polished graphics. Fun fun fun! It’s amazing how the initial concept grew into what today is known as World of Goo. Please tell them I applaud them! This sounds awesome, cant wait. This guy used both he and shee for Nyx. Is it a boy or girl? He completely blew off the "length" question. Which leads me to believe that the length of the game will be another thing this game shares with Lost Winds. Oh well, I'm still looking forward to it. Wait a moment. This looks like a serious game. No Pixel Blocks for the Rip-off? Not a remake of Ludo? Is this really a WiiWare Game? Looks too good to be true. Sounds ace - another 9/10, perhaps? Sound interesting, and I'll gladly support them if the review on here turns out great, just to encourage them to continue. Going on my watch list together with Fun!Fun!Minigolf and Wario Land Shake It (retail Wii game I know) and Sonic & the Black Knight (just naming software for Wii in general now I'd love to play). @Bahamut ZERO - Nyx is a girl. "He" was only used to refer to the players. By the way, I want to see a clear screenshot of Nyx. Sounds like it will be good. Then again, i've gotten that impression from other interviews for games which turned out to be crap but i have a feeling that this will be different. I sure hope the evasive answer to length means the difficulty will actually be there, not just pretend-difficulty as seen in most modern games where you almost can't fail and even if you just continue where you left off. I don't care THAT much if it is short as long as it is well-made and fun. But I greatly enjoyed LW and some people didn't because it was somewhat short. I look forward to this game's release. sounds cool, i hope it isn't too much though. Hello guys! I'm Rob, the guy that is interviewed here. Thanks for the neat comments. Our team is working very hard to make this game enjoyable and a fun experience for all of you/us. About game length...let me talk a bit more about that. We are currently doing some beta-testing, and the duration of a level varies a lot depending of the player. New players usually take about 15 minutes to complete a level...I've played the first level so many times that I'm able to finish them in 3 minutes or less. Another thing, the game has some "replay value". This is the type of game that you will enjoy playing a second time finding all the secrets hidden in a level. @Quarob-Thanks for mostly answering our questions on length. A question though on what you mean by "secrets hidden in a level." If you find these secrets, does something happen? I ask because everyone was disappointed when, for example, nothing happened when you collected all the hidden statues in LostWinds. I don't mind a more traditional platformer being short. 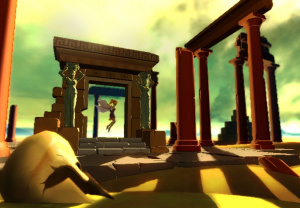 Lost Winds' brevity was bothersome because it was so reliant on finding new abilities and using them to figure out small puzzles... all of which will not be a challenge at all the next time when you know what to do already. @Quarob. 15 minutes per level seems like a decent length, but it depends on how many levels there are. Will there be a fair amount? This game looks freakin' amazing by the way. Not all puzzle games are awful, you know, I personally can't wait for LIT and Liight, although if you look at the coming soon list, puzzle games don't actually take over the list, surprisingly enough. This looks very interesting shall be keeping a close eye on this one! BUt this game seems to be added to the list of "Awsome WW Titles of 2009"
"Icarus, with his wings made of wax and feathers, flew so high that he reached a realm in the skies"
Err...that's not how I remember the Icarus myth. @Bahamut ZERO: Me too, with the only problem being too much bigging up of games, and the reason behind why there isn't a WWW user rating system as of yet. Yeah your right on that in all but the WiiWare service has too many puzzlers on it as it is and im really hoping 2009 goes in a new direction! I personally am growing sick 'n tired of the puzzle games on this service but the small amount of non-puzzle games that are literally fun and addictive(such as MM9, Lostwinds, FFMLAAK, and Star Soldier R)are a very small amount. @Wiilveit: Yeah, that makes sense. But I personally dont find a need for user ratings. In reviews, the comments section pretty much acts like one, assuming you have the time to llok through the coments. I wonder if this will be any good. This sounds really good, I'm desperate for wiiware platformers, btw nice review. Secrets leading to hidden levels!?! That's it, I'm getting your game, but you better make it challenging to find it all. @Quarob. I'll ask again: About how many levels will there be? Also, what would discovering all the secrets unlock? Alternate ending? New levels? Or just "100%" showing up on your file? I'll get your game regardless, but I'm just curious. I will definitely get this if it's long. So....... HOW MANY LEVELS ARE THERE?!?!?!?! He's not going to tell anyone exactly how many levels there are. @Alex. He could give us a hint. 27. Bahamut ZERO: Yeah, it really is neat. It's great being able to talk to someone who has a hand in the game you're looking at. I think this is a must buy. I hope it is around 800-1000 points. So many good titles for WiiWare, it is almost scary. @Alex+Ricardo: I think that's why developers better stay away from forums. Because they almost never answer a question or beat about the bush. That does not make a good impression. The folks at Nintendo surely know why they don't do this. And sometimes people seem way more symphatic before they write something in a forum. For example, it would have been IMHO much better for Luc Bernard (Remember him? The artist behind the Eternitys Child Graphics) if he didn't write some things in the Destructoid Forum. Yeah, but with a rating system, some people might try to act out against a game and sabotage the system by all give it terrible ratings for whatever reason to try and detract people from buying it, like with Spore because of the DRM controversy and the resulting bad ratings on Amazon. @ Ricardo91 -- A hint? @ness: Also, as you may have seen in this review, many people also have different viewpoints on review scores, and it's clear that not every user is going to read the scoring policy. Unless there's a better alternative out there, user reviews will probably go unsupported on WWW. But why do IGN have a rating system? Or VC-Reviews? Or nearly every other popular gaming website? @Alexsays. No. He could give us an approximate amount, like say that there will be about 20, or about 30, ect. Or they can be a little less revealing and tell us around how many hours it would take. Their response about the length was a bit blunt. EDIT: btw, you really need to change that avatar. Christmas has been over for a while now. This won't be a long game guys. Memory limitations + great graphics + extra replay value = Short game. There might be 15 levels taking a couple hours if you take your time. Expecting anything more is silly. And I'm working on the avatar thing but THIS is nothing. @Alexsays. You're probably right about that. Since the game looks this good, and Roberto was saying that the level would be full of secrets and would take a bit of time to complete, the game would have to be 500 or more blocks to hold 30 levels as well. It'd probably be about 15 levels. Tops. I just hope it lasts longer than Lostwinds. Anyway, about the Christmas decorations, it looks like someone needs to get to work lol. But don't feel too bad. One time my family had the Christmas tree up until February. Why should I pay 5000 Wii Points for a game (which has no printed manual, no cover, no cover artwork and is not even translated into German) when nearly every other retail game costs as much or less? @Objection_Blaster: Yeah, maybe you're right. Now that I think about it. A few details are better than nothing. ign are "special", and VC-Reviews's five star system is harder to differentiate from than an out of ten rating, and is therefore harder to misunderstand. If you get what I'm saying. Ricardo91 (#47): "EDIT: btw, you really need to change that avatar. Christmas has been over for a while now. I will keep it until January 31th^^. @ Wiiloveit (#51): "and VC-Reviews's five star system is harder to differentiate from than an out of ten rating, and is therefore harder to misunderstand." The solution: A five star user rating system. And the average of the whole ratings could also be a rating out of ten. Like others, I'm looking forward to this game but I worried about its overall length. I don't have my hopes up, but even if the game could last over five hours, I'd be content. Well, and if it had good gameplay. Co-op is about the only thing that isn't appealing so far.